TAHLEQUAH, Okla. — The children stand in a circle, just beyond a poster of a U.S. map that highlights the swath of the Southeastern United States that the Cherokees once controlled. The fourth-grade students are in a classroom at the Cherokee Nation Immersion School in eastern Oklahoma, where they speak, learn and write in nothing but the tongue of their ancestors. The conversation among the animated pupils bounces around the circle. 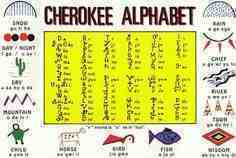 They are preparing for a Cherokee language competition and in doing so, talking about a scenario in which they are looking to meet up with their teacher, Glenda Beitz, in a Walmart parking lot — if they could only remember where she lived. The exercise aims to emphasize Oklahoma town names because “those are disappearing in our language,” said Beitz, 49, who has taught the class of eight 9-year-olds since they entered kindergarten.